If you’ve had a lot of fillings (especially silver fillings) then you may have notice that there is staining around the edges or that your teeth have even started to change color over time. This is common, especially as we age and get more fillings. There is a solution, however; with a dental crown, you can bring back that youthful smile that you remember. In addition to better appearance you are also doing a favor for your teeth. As fillings become bigger and more numerous in our teeth, their integrity weakens, and dentists frequently see fractured cusp or entire teeth. This can make placing a crown over the remaining tooth structure much more difficult. In the worst cases, it can indicate the need for root canals or even extraction. It’s not a good idea to run this risk. If you knew that the axle on your car was in a weakened condition, would you feel comfortable driving across the country? Although a fractured tooth may not be as lethal as a car accident, your teeth contribute to your quality of life and you must maintain them through your life. It is a good idea to set up an appointment with Dr. Dennis J. 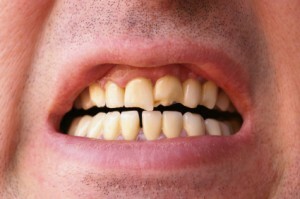 Wells for a consultation about which teeth may need to have a crown placed over them to ensure their integrity. Call us today to make an appointment and start the process for that stronger and youthful smile.